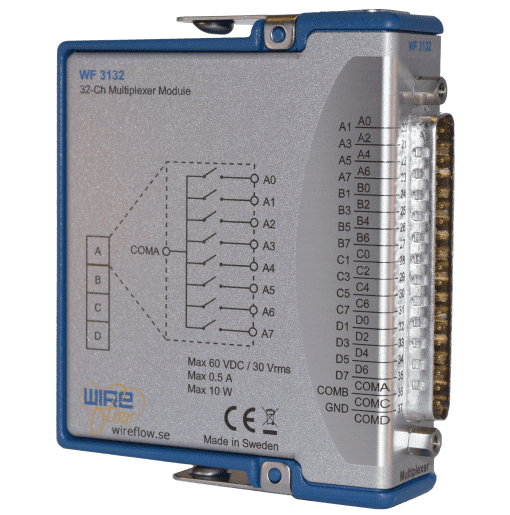 The WF 3132 from WireFlow is a 32-channel Multiplexer / Matrix Switch for Compact RIO and Compact DAQ. It is a general purpose switch that can be used to switch almost any type of signals. The relays have ruthenium sputtered contacts making them ideal for low current switching, but are at the same time capable of switching up to 0.5A. FAQ: What kind of connector are used for the module? A: The WF 3132 uses a standard 37-pin Dsub connector – type Plug. You should connect a 37-pin Dsub connector – type Receptacle to the module. 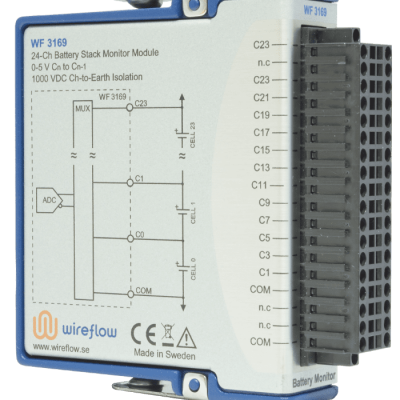 This Receptacle is NOT included with the module when shipped from WireFlow. 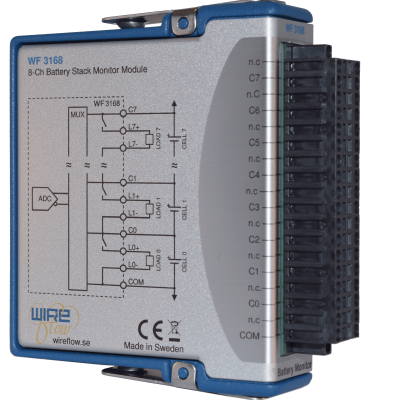 FAQ: Does the module work with cDAQ-systems from National Instrument? A: Yes. 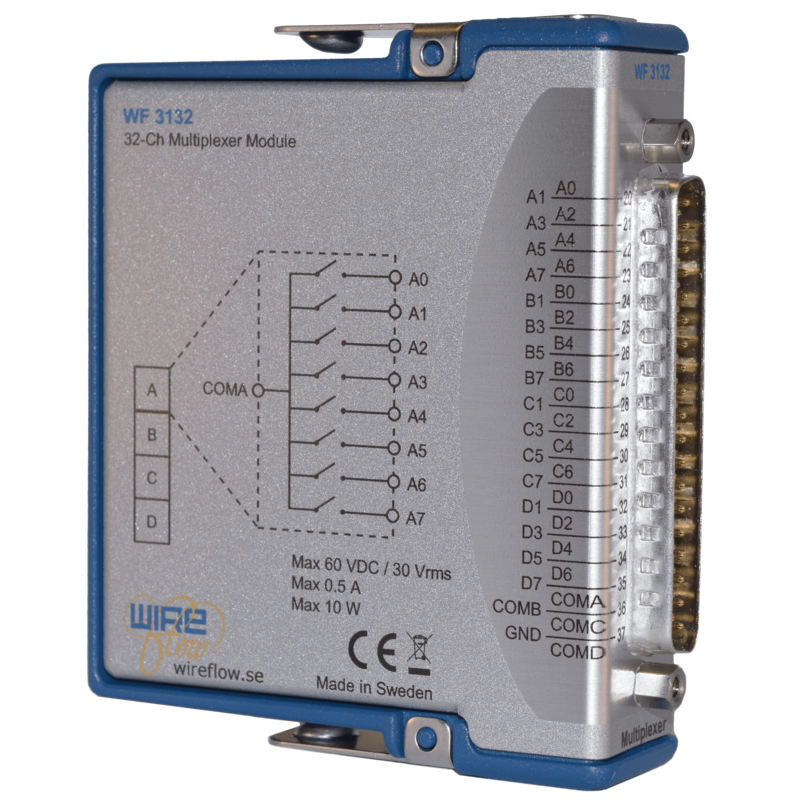 The WF3132 module works on both CompactDAQ and CompactRIO. Be certain that you select the correct driver for your target device. FAQ: How many FPGA resources does a C series module consume? A: The FPGA usage of a specific software and hardware combination is affected by multiple factors such as; FPGA type and size, compilation options, the random starting point for FPGA code placement etc. Hence, it is impossible to derive an exact figure that defines the FPGA usage of a specific C series module. For customers that are uncertain on whether their application will fit on a specific FPGA with a WireFlow C series module it is recommended to make a test-build. Note that no hardware is needed to make a test build. For more details, please see AB0005-104 AN16 FPGA Resource Usage for WF C Series modules. FAQ: Can I use ScanEngine for the module? A: ScanEngine access is not directly accessible for Third-Party modules, but it is quite easy to mix WireFlow C Series modules with other NI modules in a system and still access the NI modules in Scan Mode. Please see application note AB0005-056 AN4 Mixing WF and NI modules for a step-by-step guide how to do this. NI Alliance Partner, WireFlow AB, shows a demo that illustrates how a simple Electronic Control.